A Creone ValueBox 7006 for hospitals and pharmacies allows you to dispense medication through a self-service function and personal PIN-code. Sensitive equipment, valuables and valuable medicines can always be stored safely in a space to which only authorised individuals have access. With ValueBox from Creone, everything is always kept in good order, and you can keep track of who uses what. 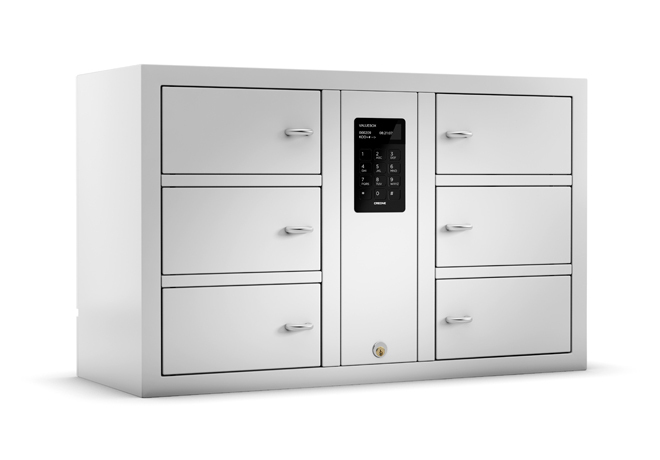 Storage cabinet in the Basic series with 6 storage compartments. Storage cabinet in the System series with 6 storage compartments. Everyday, Skobes handles keys to cars. Previously, you had to chirp all keys at the reception. We must be certain that all keys are under control. We previously needed to handle keys using manual receipts. Simple and secure storage of personal belongings. The potential for their products is enormous. Flexible KeyWin 5 makes it easy to manage everything from around 10 keys up to several thousand keys.